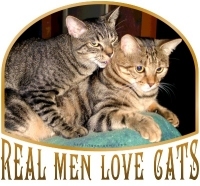 This Real Men Love Cats design is illustrated with a photo of two of our resident felines who have, as you can see, a rather unique love-hate relationship! Yes, he (left) and she (right) are both fixed! This funny image is sure to please any macho guy who loves cats, and is also used on one of our Crazy Cat Lady designs! Buy this great design now on a t-shirt, hoodie, mug, poster or other quality giftware or apparel item, exclusively from GearGems.